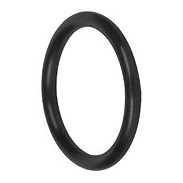 The O-RINGS in elastomer have a round shape,vulcanized in tools. compression.This strength combined with the one of the fl uid to be sealed, increased by the pressure, can guarantee a perfect sealing. For static applications it is possible to obtain O-RINGS by using an extruded cord joined with an appropriate glue. The most common sizes in NBR and FPM elastomers are available ex-stock. You can search by the o-ring's dimensions, then you will be provided with all possible options. Enter (o-ring's) dimensions, or part of its dimensions. weathering.Poor resistance to mineral oils and greases. (silicone elastomer) 70 Excellent resistance to hight and low temperatures. greases, oils and synthetic oils. heat resistance.Conforms to FDA standard. (tetrafluoroethylenepropilene elastomer) 78 / 90 Excellent resistance to superheated steam.